Conveniently located on 10 Avenue North in the heart of Myrtle Beach, Myrtle Waves features some exciting activities for kids of all ages. The park has a wide variety of slides, pools and raft rides so there is something for every member of the family. 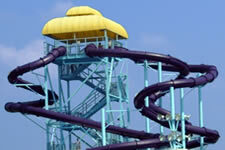 Those looking for an adrenaline rush should check out the many water slides throughout the park. Slides like the Turbo Twisters and Snake Mountain feature exciting twists and turns while the Riptide Rockets and King Cobra are all about speed! The Arooba Tooba is a spinning ride that will circle the slider around and around until they come crashing down to the bottom in a magnificent splash. For those less adventurous family members, try floating around on the 20,000 square ft Ocean in Motion wave pool, relax in the 1,200 ft LayZee river as you drift around the park or grab a skimmer board and jet along the Racin' River at 10 miles per hour. Toddlers and younger kids will enjoy Saturation Station and Bubble Bay. Saturation Station is an interactive Caribbean-themed water playground with a myriad of slides, water falls, a 700 gallon erupting volcano as well as 2 four-level play areas with water shooters and fountains. Bubble Bay is a large pool (water depths: 6-18 inches) featuring water umbrellas and bubble jets. Water park lovers will also want to visit Wild Water & Wheels for exciting water slides, go-karts, bumper boats, a mini-golf course and kiddie carnival rides. 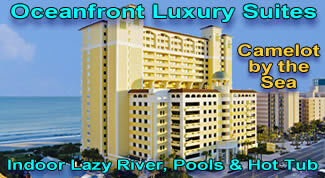 Visit our Hotels & Resorts section and you will find a wide variety of oceanfront family resorts and hotels conveniently located in the heart of Myrtle Beach near area attractions including Myrtle Waves Water Park.